NGC 4414 (also known as UGC 7539) is a massive unbarred spiral galaxy of some 56,000 light-years in diameter, located about 62.3 million light-years away in the constellation Coma Berenices, while it is moving away from us at approximately 716 kilometers per second. It is a member of the Coma I group of galaxies, very close to the Virgo Cluster. 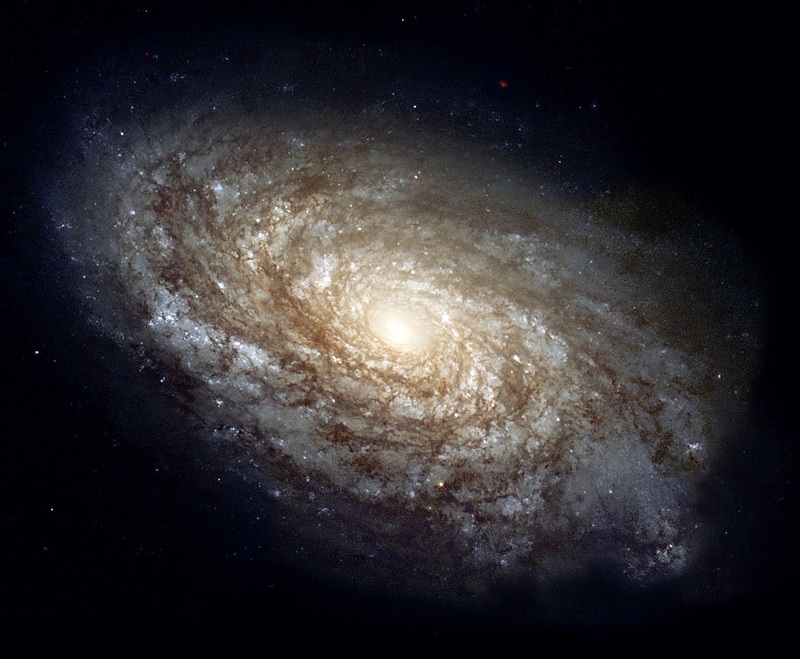 NGC 4414 is a typical example of a flocculent galaxy, what means it is patchy, with discontinuous spiral arms (the opposite of a grand design spiral galaxy, which has well-defined spiral arms). The central regions of this galaxy contain primarily older, yellow and red stars. The outer spiral arms are considerably bluer due to the ongoing formation of young, blue stars — the brightest of which can be seen individually — between which is what appears to be a Luminous Blue Variable. The arms are also very rich in clouds of interstellar dust, seen as dark patches and streaks silhouetted against the starlight. NGC 4414 is quite isolated in space, without signs of past interactions with other galaxies. The galaxy exhibits a high gas density and therefore is very rich in gas, both neutral hydrogen and molecular hydrogen, of which the neutral hydrogen extends far beyond its optical disk. Despite the high gas density, NGC 4414 is not a starburst galaxy, a fact that could be related to its isolation. In 1974 a supernova, SN 1974G, was observed which is the only supernova in this galaxy to be recorded so far. But, strangely enough, there is no direct evidence for a supermassive black hole in the center of NGC 4414. Based on careful brightness measurements of the many Cepheid variable stars in NGC 4414, astronomers were able to make an accurate determination of its distance. Along with similarly determined distances to other nearby galaxies, NGC 4414 contributes to astronomers’ overall knowledge of the expansion rate of the Cosmos, and helps them determine the age of the Universe. This composite image is obtained with the Hubble Space Telescope in 1995 and 1999, using the Wide Field Planetary Camera 2 through three different color filters.